Rev. 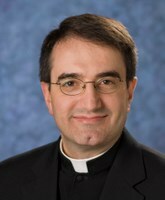 Pablo T. Gadenz, a priest of the Diocese of Trenton, NJ, is Associate Professor of Biblical Studies at Immaculate Conception Seminary School of Theology at Seton Hall University, South Orange, New Jersey. He is also on the Formation Faculty of the Seminary. He received his licentiate in Scripture (S.S.L.) from the Pontifical Biblical Institute (2005) and his doctorate in biblical theology (S.T.D.) from the Pontifical Gregorian University (2008). His published dissertation is entitled Called from the Jews and from the Gentiles: Pauline Ecclesiology in Romans 9-11 (Mohr Siebeck 2009). He is the author of The Gospel of Luke (Catholic Commentary on Sacred Scripture), Peter Williamson and Mary Healy, series eds. (Baker Academic, 2018). Father Gadenz is a member of the Catholic Biblical Association of America and the Society of Biblical Literature.